SAFECOAT LATEX ® Fire Retardant Coating is a single component latex-based, intumescent fire retardant coating ideally suited for interior applications to SPF Plywood (Spruce/Pine/Fir), Oriented Strand Board (OSB), wood trusses and rough stud construction, where Flame Spread Ratings of 25 or less ("Class A" or Class 1) and low Smoke Developed Ratings are required. It limits flame spread by expanding to many times the original dry film thickness when exposed to heat. This expanded material forms a char which insulates the substrate against heat, and reduces available oxygen to the surface, thus limiting flame spread to a "CLASS A" rating on OSB, SPF plywood and Douglas Fir Decking as tested under ASTM E84-91a and CAN4-S102-M88 standards in a single coat application sprayed at 150 ft USG. 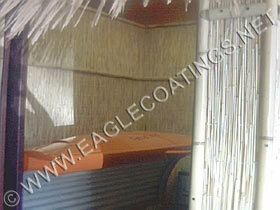 SAFECOAT Latex dries quickly to a flat (matte) finish, having the appearance of conventional flat paint. • Imparts a Class A Flame Spread Rating to dimensional lumber, plywood and Oriented Strand Board (OSB). • Acts as a thermal barrier to protect foamed plastic insulation when used in conjunction with OSB. • Used in lieu of drywall on plywood and OSB for greater strength and resilience. • Replaces sprinklers in combustible concealed spaces, under NFPA-13. • Can be applied as a mandatory upgrade to assist owners and property managers to meet the latest fire and building code requirements. It may also be applied as a voluntary upgrade to lower fire risks and reduce insurance costs. • Is non-toxic. It contains NO asbestos, harmful ingredients or solvents. • Is cost effective. A single coat applied at 150 ft'/USG achieves a "Class A" Flame Spread Rating. • Is fire resistant. It will not burn in liquid or solid state. Under fire conditions, it forms a char, preventing the spread of flames, and slowing the penetration of heat through the substrate (Fire Endurance). • Has excellent adhesion and durability. • May be tinted with a latex based "Universal Tint". • Will adhere to metal and acts as a rust-inhibitor. • Is easy to apply - may be applied by brush, roller or spray. Tinting: May be tinted. Use standard latex or universal colorants. Do not exceed 26 mL of tint per liter of Safecoat Latex. Packaging: Available in one and five US gallon quantities.